While having a drink at ON Dining Kitchen and Lounge last month, Jeremy told me that he had taken on a consulting assignment with the people before Épure, and that he would be spending a few days in the first week of August at the restaurant. While I enjoyed my first meal at Épure very much, I did think there were areas which could use some improvement. I was very curious to see what changes Jeremy would make, so I made a reservation for tonight. One of the changes Jeremy had mentioned was a shorter menu in addition to the 6- or 8-courses options previously available. This was certainly a good thing, since not everyone wants to spend 2-3 years at dinner. However, they continued with the "for her" and "for him" menus... which are just really stupid. Who the hell decides which dishes are "feminine" and which are "masculine"?! Anyway, once again I chose the menu "for him", and took 8 courses. We were served some snacks, but this time around no one bothered to tell us what they were. Maybe they thought we'd had them before, so there was no need to explain. 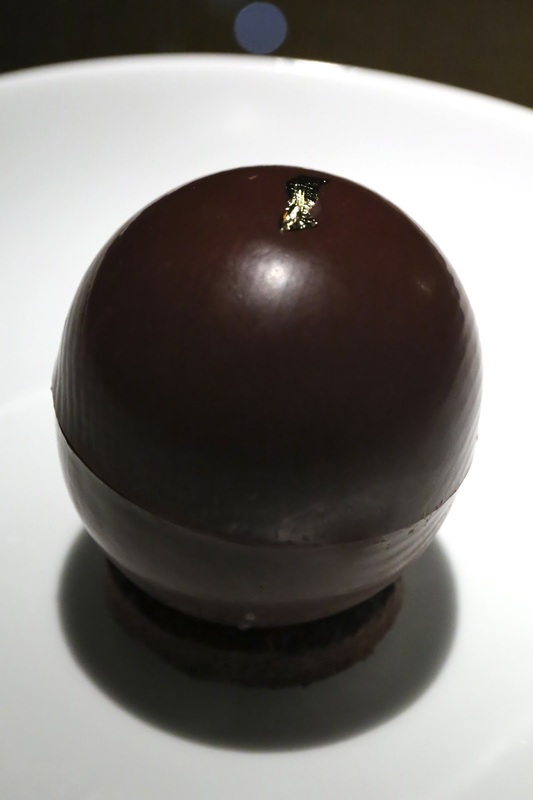 Well, I can see that we had the foie gras bon bon again, with the cherry coating providing nice acidity. Likewise there was the cheese croquette, although we thought there might have been a hint of truffle in the liquid center. The tart, though, was different from my last visit. I thought this might have been carrot purée, but there was a little bit of acidity here. The little mint leaf on top was nice. Amuse bouche tonight was cauliflower velouté with hazelnut foam on top. I love cauliflower, and also love the flavors of the toasted hazelnuts, but I was a little surprised by the sharp acidity of the hazelnut foam. Le saumon sauvage de l'Adour et melon de Cavaillon - what a pretty dish! Two small blocks of hay-smoked salmon from the Adour River in the Pyrénées are wrapped in thin layers of gel made from Cavaillon melon - looking like candies in wrappers. The salmon was delicious, and I love the sweetness of the melon gel. Served with a little bit of finger lime caviar on top, as well as cubes of Cavaillon melon and sour cream on the side. Yum! Le homard de nos côtes - I was a little confused at first... since the menu says "de nos côtes" but the dish featured homard bleu from France. Anyway... One piece of the lobster was served "cannelloni-style" wrapped in celeriac and poached in butter. Another piece of lobster was deep-fried as a dumpling, with a basil leaf inside. Served with celeriac purée and lobster consommé. Gotta say the fragrance of the consommé was very alluring. Le canard de la Maison Bergaud - a nice little sliver of Challans duck, perfectly executed. Unfortunately, the sliver was so thin (I'm inclined to use the Chinese expression of "不夠塞牙縫" - literally "not enough to fill the gap between one's teeth") that it left me woefully unsatiated. Loved the blackberries from Provence, and the pearl onion, and even the "pommes dauphine" on the side. La pêche - WOW! An absolutely beautiful dessert! Poached peach encased in verbena gelée, topped with peach sorbet and verbena emulsion. Wonderful flavors with ripe peaches and the delicate fragrance of verbena. Incredibly refreshing and perfect for summer. One of the best dessert I've had recently... and surpassed only by the amazing peach/lychee/almond tofu/Oolong jelly combination at Ta Vie 旅.
Petits fours - featuring orange blossom water macarons, pistachio and jasmine cakes with white chocolate, and chocolate tarts. I was balking at the exorbitant corkage charge of HKD 700 per bottle on my last visit, but seeing Hello Kitty really enjoyed the Champagne from Françoise Bedel last time, I decided to bring along one of my own bottles. The staff who recognized me on both visits remembered that I had ordered a bottle of Bedel on my last visit... which is commendable. In the end we were charged HKD 500 for corkage... not sure if this was one of those changes that Jeremy made? 2003 Françoise Bedel L'Âme de la Terre Extra Brut - nice and caramelized on the nose, a little toasty. Ripe on the palate. Such a delicious wine.